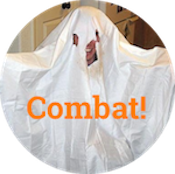 Amazon product reviews: skeleton stands - Combat! I write this while standing up, because I am a weirdo. In my ongoing, possibly insane quest to fix my rickety body before I get too old, I have constructed a standing desk. It is not a work of great craftsmanship, but it delights me. I have come to suspect that human hamstrings were not designed for eight hours of boneward pressure each day. Standing work makes me very happy, although my standing desk does not, and so I set out to find some new means of raising my laptop to eye level. What holds things at eye level? I asked myself. That is how I lost several hours reading Amazon reviews of stands for model skeletons. I think that if our ancestors saw the society we have constructed today, once they stopped screaming they would be really impressed with the number of skeleton stands we make. 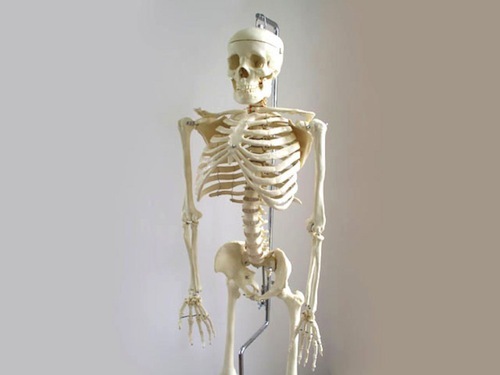 In junior high school, my science teacher had a model skeleton that we were never to touch or learn from, and that thing stayed up the whole year. I took it for granted, at the time. It turns out, though, that a human skeleton stand costs a lot of money—or not that much, if you are willing to compromise in certain areas. Hence the importance of product reviews. This is a good product for the money. The casters were a little flimsy and don’t swivel very easily under weight, but otherwise a good stand. Be aware that this stand is made to attach to the base of the spine of a skeleton. We purchased it for an older skeleton that needed to be hung, so I had to fabricate an extension. Still, for the money it is a good stand. Our first one came with a defective rod, and customer service was terrific about sending a new one right out. I bought this because the full size was too expensive. Overall it is fine but the spinal curves are not correct, and the ribs are crooked, too up and wide compared to the real ribcage. The size is great, I have it on my desk and can watch it every day. The tailbone and lumbar spine bother me the most because the curvature is not posturally correct. I teach Pilates Method of Contrology and I really like having the skeleton to see every day. Wish that there was a skeleton with movable scapulae and better hip joint articulation that was affordable…. so I would recommend this with caution to the details. You need an anatomy book and prior understanding to correct the imperfections in your mind. One pictures V. Jung staring at Mr. Thrifty all day, correcting his imperfections in her mind, then going home to correct her family via the Pilates Method of Contrology. But I don’t care how inaccurate he is—Mr. Thrifty is a great name for a skeleton. The practice of naming model skeletons is apparently an industry standard—although sometimes it introduces problems, as with the not-so-thrifty Stan. In a world that makes dozens of skeleton stands, “skeleton Stan” is virtually unsearchable. Then there is the disturbingly-named My First Skeleton (Tiny Tim.) The phrase “my first skeleton” takes on a lot of fun connotations in the context of childhood. One is forced either to think of Tiny Tim as the skeleton of a child—in which case it is his first and only—or to presume that the child in question will collect many, many more skeletons over the course of his life. Delmar F. Davis just saved me 25 bucks. I love the wormholes the internets is constantly opening in my life. Reading this article was one such, but I have no regrets. I imagine the marketing or R&D department at Mr. Thrifty Skeleton googling their product and finding this post. It’ll undoubtedly make the e-mail rounds through the company all the way up to the CEO. And so begins Dan’s slow decent into madness.